Home » WOD Blog » Kale-licious! 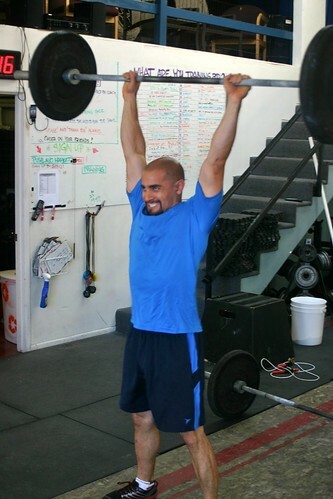 Notes: Advanced versions of the ring row are with a full turnout at the bottom or wide grip. Notes: 2 Box Lateral Box Jumps should be performed with two boxes side by side, approximately 24 inches apart. One complete rep would include two jumps across the boxes. Basically, start to the outside of the set of boxes, jump laterally across the first, then the second, and finish on the opposite side of the boxes. Touching the top of the boxes is not only recommended, it is required. 100 Ab mat sit ups! 1. Blend ingredients in high powered blender! This is just another way to get your immense amount of kale that we get in the veggie delivery into your body. You can play with these ratios and with different fruits, taste as you go! This is just what has worked for me. I worked up to more kale and less fruit but still wanted the smoothie to be tasty enough for me to not dread it. I have played with it before by adding more fat, for example handful of nuts or almond butter (be careful with amount). I have even once or twice, or maybe thrice, added cinnamon or cocoa powder before to make it a treat : ) The sugar from the fruit and cocoa work well together. Cinnamon is even known to help with blood sugar regulation so it might not be a bad idea to put a spoonful in because of the intake of fruit… Hmmm just something to think about. Fresh mint or basil would be a nice addition as well. In the past I added egg white for a complete meal being able to get my protein in as well. I have learned that for me it is better to whip up some eggs in addition to the smoothie, it holds me over for longer between meals. I have also read that it is better to eat the whole egg instead of just the whites, which is another reason for my change. The egg is together for a reason, the yolk and white have different nutrients that worked together on purpose making a more complete protein and nutrient dense food. I have even had half a pemmican bar along with my smoothie for a quick breakfast. Lastly, an option you could do if you want the smoothie to be a one stop shop is add a protein powder of your choice!